Spain’s leading port operator Noatum invests over EUR 100 mln in its container terminal in Valencia with the aim to increase its capacity and allow mega vessels of over 20,000 TEU call the facility, informs the company. The investment plan includes expansion of the equipment fleet. Thus, Noatum has recently commissioned a new Malaccamax STS crane manufactured and supplied by the Spanish engineering company Paceco España S.A. The state-of-the-art crane has a waterside outreach of 68.5m and is capable of handling 25 rows of containers on deck. It has an SWL of 65 tons under spreader and is equipped with the twin-mode operation and the newest Siemens control technology. The crane is already fully operative and will significantly increase the quality of the service offered to Noatum’s customers. Additionally, Noatum plans to enlarge 4 operational STS cranes to attend mega vessels and in July-August to receive 2 Paceco portainers from Malaga container terminal with 60m boom length, 41m lift height under spreader, 61 ton lifting capacity in twin mode and Siemens control. Besides, the terminal has received 6 new RTG cranes during the first half of 2017 and expects 3 more RTGs by Konecranes in the course of July. These will be Octo 8-wheelers with 51-ton lifting capacity, stacking capacity of 5+1 high and 6 wide, Siemens control and Dynapilot. 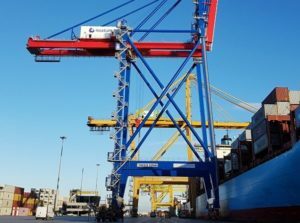 Noatum’s Terminal in Valencia will thus be equipped with 58 RTG cranes. During the month of August, the company has confirmed the acquisition of 2 lifters Konecranes-Terex model FDC25K7 and FDC25K8, with a capacity of 10 tons, and 7 Kalmar terminal tractors model T2. Finally, in September, Noatum Valencia Terminal will receive a new reach stacker Konecranes-Terex Liftace R5-33S, with a capacity of 45 tons. In parallel, the Port Authority of Valencia is executing a EUR 30 mln investment plan to increase the port depth to almost 18m in order to enable receiving mega ships in optimum conditions. Douglas Schultz, CEO of Noatum, said: “The acquisition of the new machinery is very good news. It shows that we are meeting the established commitments and deadlines to improve Noatum’s equipment and services in Valencia. This, together with the works undertaken by the Port Authority of Valencia to improve the port infrastructure, will turn the port of Valencia into the reference hub for mega vessels in the Mediterranean”. The public Noatum Container Terminal Valencia handled over 2 mln TEU in 2016.